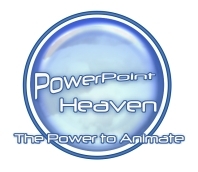 Gary Andrew A. Lacanilao (Radz) specializes in drawing human characters using PowerPoint. He has also been designing logos in PowerPoint 2007, making use of its new graphics engine, shape effects and advanced features. Check out his PowerPoint Gallery at Friendster. Collex is a lively collection featuring 16 sets of human faces. Tips: To see how these faces are being drawn, hold down Ctrl key and press 'A' to select all objects. Ungroup the autoshapes (right click on the face, select Grouping > Ungroup). Repeat this step until you can't ungroup further. Then, right click on any of the Freeforms and select Edit Points. A set of logos drawn using PowerPoint 2007, making use of its new features such as gradient fill and bevel effect. A simple yet neat animation on spin effect. An artwork featuring 4 girls on a vibrant background.